International Arts + Mind Lab (IAM Lab) is a multidisciplinary research-to-practice initiative accelerating the field of neuroaesthetics. Jazz pianist Keith Jarrett performed some musical magic in 1975 at the Cologne Opera House in Germany. For more than an hour, he played enthralling solo—and his entire performance was an improvisation, from first note to last. A recording of his feat called The Köln Concert became one of the best-selling jazz albums of all time. This wasn’t the only time Jarrett improvised a performance, and many jazz musicians seem to conjure music out of thin air. But it’s no magic act. It’s a mysterious alchemy between science and art. One of the top detectives investigating this mystery is Dr. Charles Limb. A leading researcher on improvisation, sound perception and creativity, Limb currently holds a number of impressive titles at the University of California, San Francisco (UCSF): Francis A. Sooy Professor of Otolaryngology – Head and Neck Surgery; Chief of the Division of Otology, Neurotology and Skull Base Surgery; head of the Sound and Music Perception Lab; and Director of the Douglas Grant Cochlear Implant Center. He is also the Medical Director of Cochlear Implantation at UCSF Benioff Children’s Hospital in Oakland, California. Music was ever present in Limb’s childhood home, and his parents encouraged him to start tickling the ivories early on. He began playing piano at age five and the saxophone in middle school. As a young teen, he honed his playing ability largely through improvisation. “Since I wasn’t actively studying piano, improvising was how I expressed myself on the instrument,” he said in a phone interview. Limb’s interest in improvisation helped spark a passion for jazz. A deeper immersion in both playing and listening to jazz followed in college, when he often performed in jazz combos with the saxophone. Limb’s investigations of brain activity during improvised musical performance continue to enhance our understanding of creativity. 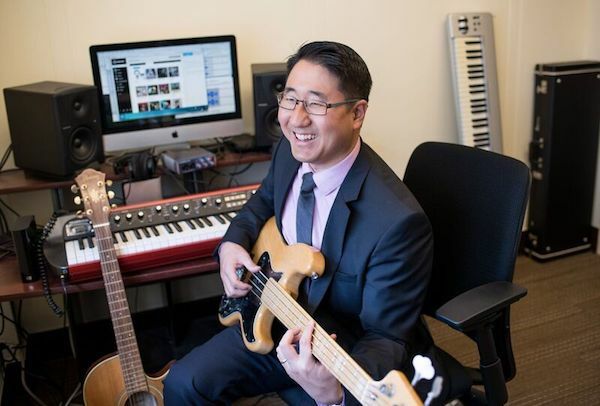 During a post-doctoral research fellowship at NIH, Limb performed functional magnetic resonance imaging (fMRI) scans on the brains of professional musicians as they played a memorized piece and when they improvised on the piece. In the improvising group, scans revealed activation of the medial prefrontal cortex—which is involved in self-initiated thoughts and behaviors—as well as deactivation of the dorsolateral prefrontal cortex, which is involved in conscious self-monitoring or filtering. These activation patterns may provide a “signature” of the creative process in improvisation, a combination that facilitates the musicians’ ability and willingness to act on novel impulses. Limb has gained new insights about the role of music in communication by scanning pairs of musicians as one played a memorized song while the other “responded” to it with an improvised take on the song. In the improvising participant, activation occurred in areas of the brain important in language and expressive communication. This suggests that music truly is a form of language, which makes perfect sense; our voices shift in pitch, volume and pace according to the type of message and emotions involved in our communications with others. Limb’s improvisation research continues to expand as he explores the creative process in everything from jazz piano to rap music. Recent areas of interest include how creativity develops in children, improvisation by comedians, and brain activity in world-class musicians during improvisational tasks. Other investigations address whether improvisational music-based therapy can improve mental flexibility, agility, and even problem solving and motor synchronization. Limb hopes this type of therapy may help people with Parkinson’s disease, depression or Alzheimer’s disease. Since Limb’s credentials as a researcher of sound and music perception and creativity are so impressive, it’s easy to forget that he’s a highly respected otologic surgeon. In 2011, he restored the hearing of the daughter of an FBI member stationed in Iraq. The U.S. flag was flown in Limb’s honor over the American Embassy in Baghdad. For the hearing impaired, Limb spearheads research at UCSF’s Sound and Music Perception Lab to improve pitch perception in those wearing cochlear implants (CIs), which are surgically implanted hearing aids for those with severe-to-profound hearing loss. One study uses brain imaging to create personalized pitch maps that may enable CI users to have better music perception. The Sound Lab is also developing personalized auditory/musical training programs for improvement of music and sound perception. Meanwhile, Limb hopes to revise the eligibility criteria for CIs to bring sound into the lives of more people in need. Part of this effort involves a partnership between The Sound Lab and the San Francisco Conservatory of Music to create a summer choir comprised only of those who wear hearing aids or CIs. In his keynote address at a meeting of the Society for the Neuroscience of Creativity last week, Limb discussed a study in progress that will compare the brain activity of several world-class musicians as they play from memory or improvise. He hopes that this and other research will move us closer to understanding the brain processes underlying creativity in general. Written and reported by IAM Lab Contributor Ed Decker. Ed Decker is a freelance neuroscience writer and former Science/Health Editor at Rewire Me, a wellness website. © 2019 International Arts + Minds Lab. All Rights Reserved.